Ai Wei Wei, China's most famous artist and dissident. Watch this short film from Alison Klayman who spent months documenting his life. Who’s afraid of Ai Wei Wei? The Chinese government for one. Ai Wei Wei is China’s most famous contemporary artist—renowned for solo exhibitions the world-over, including his famous installation at London’s Tate Gallery when he filled a room with 100,000,000 hand-painted ceramic sunflower seeds, a show which cemented his standing as one of the few current global art superstars. It’s an unusually large profile for a Chinese citizen—for all their economic gain, the Chinese suffer a deficit of global celebrity, and, much to government authorities’ chagrin, Ai Wei Wei has vociferously used his fame to speak his mind. A prolific blogger and tweeter, he often publishes ranting screeds against injustice, corruption and abuse, which censors would invariably take down. Most famously, after assisting in the design of China’s renowned 2008 Olympic Stadium the “Bird’s Nest”, Ai Wei Wei publicly repudiated the project and the whole Olympic buildup as a farcical sham to put on a “good face” for the international community. A fascinating subject, freelance filmmaker Alison Klayman had spent several month with the artist documenting his work and life, as well as capturing his many provocations and scuffles with the government. The footage, destined for a feature film entitled Ai Wei Wei: Never Sorry (8 days to go on its Kickstarter Project!) was adapted by Klayman for this 17 min short which played PBS stations March 29th, as part of an episode of Frontline. It’s a fascinating introduction to a fascinating artist—his work, his politics, and how, like so many great artists before him, they really are one and the same. As you may know though, a mere 5 days after the television airing of this short, Ai Wei Wei was detained by police at Beijing airport, and proceeded to vanish. No word was given on where he was taken to, only a vague statement from authorities that he had committed “economic crimes”. His associates and lawyer were also targeted and disappeared. A global outcry went out, as governments and social organizations blasted the Chinese government for what they deemed a politically motivated move. However the protests appeared to have no effect. 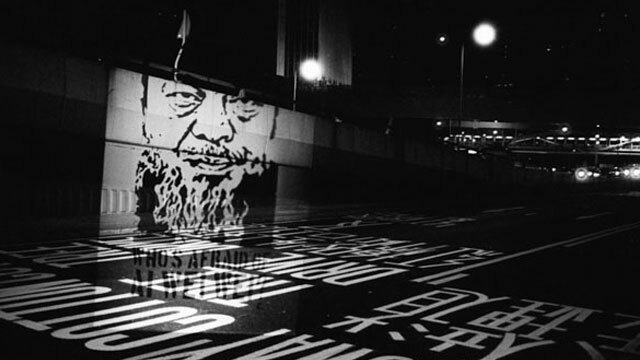 Youth culture began to assert itself, and based off the title of this short film, stencil graffiti and light tags imaging Ai Wei Wei, went up all around Hong Kong and mainland China, in spite of extraordinary risk. The image above is a one of a series of light projections photographed. After 43 days of silence, Ai Wei Wei’s wife was finally allowed to visit him on May 15th. She confirmed that he had not been maltreated, and was in good health, but his imprisionment does not look as though it will be overturned any time soon.